Call the police, I was robbed. While most of you were enjoying all the beauty of a gorgeous weekend, I was holed up indoors, pacing back and forth between the bedroom and the living room. I’m approaching the one week mark on a cold that won’t leave me alone. All I could do was sleep, eat, watch TV, and nap. I couldn’t read because my eyes are still infected. Even if I could read, I wouldn’t consider Haruki Murakami leisure reading so I’ve had to set aside his book The Wind-Up Bird Chronicle for a little bit longer. It’s a beautiful, well-written book, but dense. It’s not for pleasure readers who consider The Hunger Games and Harry Potter fine writing. I only left home a handful of times. Friday night dinner at L’Ottavo a block away, our favorite little neighborhood Italian restaurant. Saturday morning brunch at Sears Fine Foods on Powell, celebrating 75 years in business! Saturday night dinner next door at Le Colonial, I forget how consistently good their food is. Sunday afternoon stroll around the neighborhood. 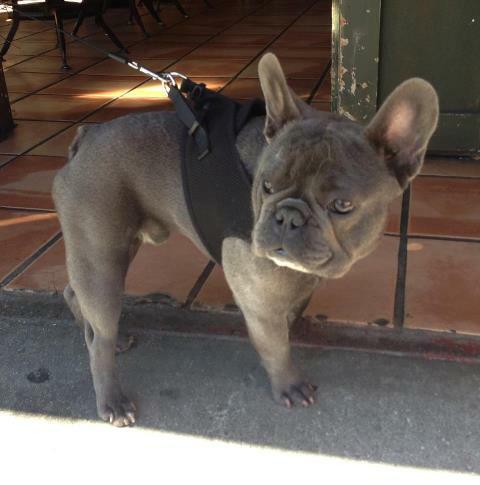 The owner of a corner coffee shop has this precious blue French bull puppy. I want to steal him.